Celebrating its 20th birthday this year, the Angel of the North has become an object of conversation, divergent opinion and comment. Perhaps this is why it has been used by marketers and campaigners to promote their product or cause for many years. In the following blog, we examine whether use of the Angel for marketing is disastrous or divine and how John Mason International took it one step further. The town of Gateshead lies just across the River Tyne from its more famous neighbour Newcastle. However, Gateshead boasts one of the country’s most recognisable structures – the Angel of the North, a 66 ft tall piece of contemporary artwork. 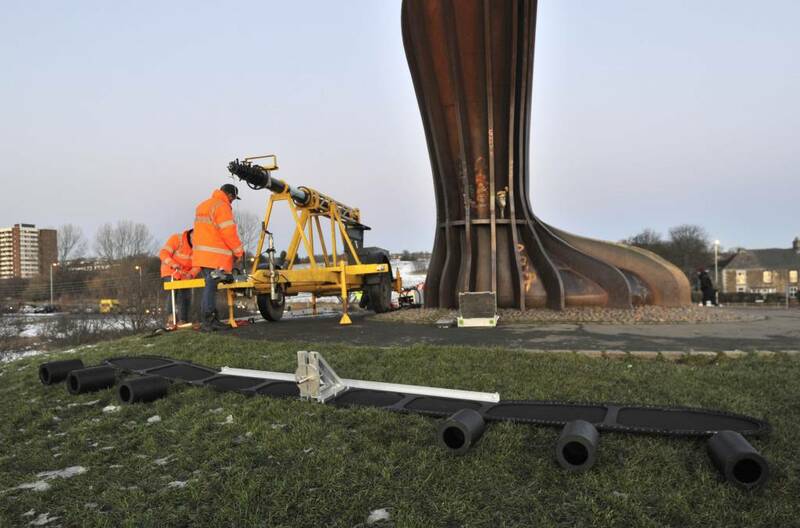 It was designed by world-famous sculptor Antony Gormley and installed in 1998. Ever since, the Angel has become a popular target for marketers seeking to do something on an epic scale to promote their products and services. Even before its creation, there was a significant amount of negative feeling towards the sculpture, even stirring up a movement to stop its build. It took a while for the local population to take it to their hearts, but now it is an object of great pride for the people of the northeast. When you consider the strong feelings held by the local population, and the indeed the close-knit art world, towards the Angel, it’s a brave marketer who says ‘let’s project our message onto the Angel of the North’ for their latest promotional stunt. But it has happened on quite a few occasions over the Angel of the North’s 20 year lifetime. The first of this type of campaign to use the monument was a tribute by Newcastle United fans to honour of their goal scoring hero Alan Shearer. This initial stunt did not end particularly well, with Northumbria Police appearing after only twenty minutes and demanding the giant number nine shirt be removed. The statue earned notability again when national supermarket chain Morrisons displayed a large baguette on the wings of the object. This action was criticised widely across many media outlets with scathing comments by the artist Antony Gormley. Many also took to Twitter to slam Morrisons’ stunt, describing it as ‘tacky’ and ‘disgraceful’. More recently, the Angel even played his part in promoting the vote for the exit of Britain from the European Union when it featured a ‘Vote Leave’ slogan, projected across its wingspan. And then finally we have us…. 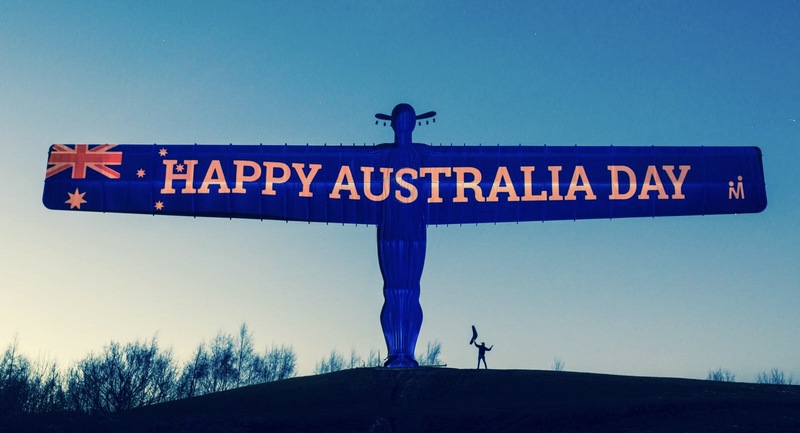 In January this year, John Mason International incorporated the Angel of the North into it’s Australia Day celebrations. In addition to projecting a ‘Happy Australia Day’ message across the wingspan and turning the Angel completely blue, we took it one step further and turned the Angel into an Aussie by placing a 15 ft cork hat onto its head. The Aussie Angel gained national publicity, featuring in publications such as The Times newspaper and Daily Mail Online. However, on this occasion history also played its part in the stunt being even more controversial, as the Australia Day theme added extra spice. On the 26th January 2018, thousands of activists flooded the streets to protest against Australia Day, labelling it ‘Invasion Day’, and claiming that it was in poor taste to celebrate a brutal invasion. Over its twenty-year history, the Angel of the North has evolved from being a controversial landmark to an object of great pride. Many would prefer to keep it pure and are angry about its use over the years by marketing companies, protesters and activists for their own gain. But it could be seen as a mark of its enduring popularity that it has stayed at the forefront of the public’s imagination and remains the go-to monument for this type of stunt. It could be argued that such promotional activities keep the Angel in the public eye to a greater extent than other comparable structures outside of the nation’s capital. People will continue to have opinions about how the Angel is used, but it is certain that in another 20 years it will still be a matter for debate. All we know is that we loved making the Angel an Australian for the day and were delighted that The Times and the Daily Mail covered the story. Happy 20th Birthday Angel of the North!